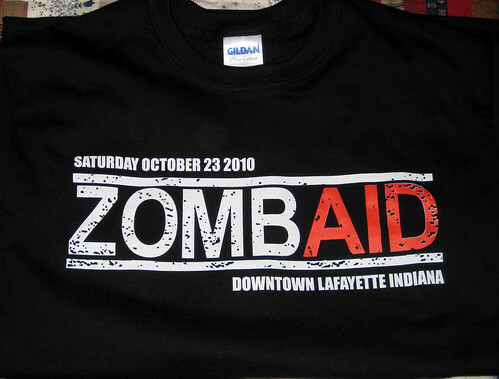 On October 23rd, the Lafayette area of Indiana was greeted by a horde of zombies going door to door for Zombaid. These were no ordinary zombies though. They were not out for blood or brains but for boxes of food to give to the Food Finders Food Bank. Approximately 60 zombies staggered together down the streets of downtown Lafayette picking up food donations from the local businesses. Zombaid organizer, Rob Soden (who was a blood spattered Shaun from Shaun of the Dead), was happy to make the event happen saying, "The folks at Food Finders say one pound of food equals one meal for someone." Lafayette's Zombaid brought in over 700lbs of food for the food bank. The numbers of both zombie participants and donations exceeded expectations according to Soden who helped weigh the food as it was brought in. It wasn't just adults dressed as zombies either. Both children and pets got involved in Zombaid. You can view a video capture of the Zombies of Zombaid as they went door to door here. Soden told JConline.com, "It was a sea of people. ... I think word of mouth will spread and it will be bigger next year." Visit Food-Finders to read more about the Zombaid event and other upcoming events.